In June 2012 during a conversation with John Peskett, a stalwart Allard owner, he mentioned to us that he thought we might be interested in a rare Palm Beach Mk2. One of only two believed to be in the UK and this had been offered to him for restoration. 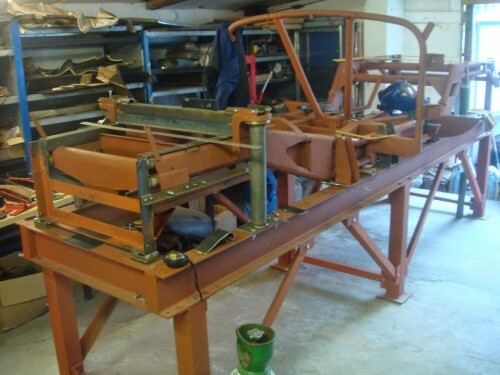 John decided that he had too many car rebuild projects on the go, so would not be able to take on the restoration. The car was manufactured by the Allard Motor Company in 1956 for display on the Allard Company Motor Show stand at Earlscourt. The first of only six drophead Mk.2 Palm Beach cars produced. The car was used as a demonstrator for sometime and then used by Brian Howard, a manager at the Allard Motor Company. The car was sold to Mr. Walter Hemsworth in 1969, being used in the north London area until 1976, when it went into storage. Since that time, it had not turned a wheel until we visited Peter Hemsworth in 2012 in Ware, Hertfordshire. We purchased the car and collected it in August 2012. Transported it initially to my work in Wales, near Monmouth, to carry out a full strip down and inspection. As we looked under the skin, it soon became apparent that the car was in very poor condition. In particular, the steel components such as sections on the underside of the chassis, the steel bulkhead and engine bay side panels. 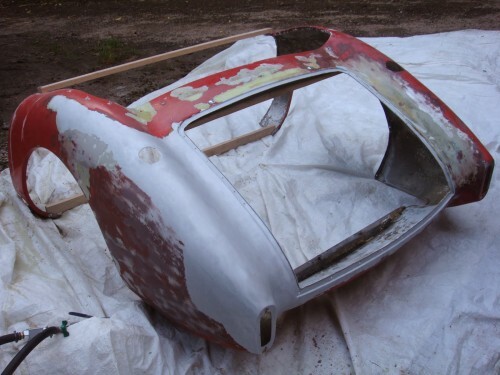 The first major task was to completely strip the paintwork and quantities of body filler (much easier said than done!). Most of it was done with a high pressure blaster using a fine soda mix. This proved a dirty and time consuming job, which had to be done out in the open (weather permitting!) due to the lack of suitable sealed inside space. Thought a set of younger eyes would be better for this – so Lloyd pulled the short straw! This car had not turned a wheel since 1976 and had spent the last few years out in the open with limited protection from the elements. Therefore, we expected to find plenty of water damage to the interior and corrosion – we were not disappointed! The doors, bonnet, boot lid, twin steel fuel tanks mounted inside the rear wings were removed. Both were badly rusted – one with a hole right through the bottom. The heavy copper cored radiator appeared, on first inspection, to be in good condition. This was removed, together with the surrounding inner panels. The hood was already off the car, but all the pieces, including the side screens were there. Next job was to remove the hood frame, bucket seats and remains of carpets and badly rotted and disintegrated plywood floor panels. All the screws and coach bolts had to be cut, ground or drilled out. As most of the many inner panels were steel, not aluminium, all would have to be replaced due to corrosion. Dismantling of the dash panel, instruments wiring loom and panels in the bulkhead area proved to be one of the most difficult tasks, since we needed to use everything as patterns, including the wiring loom, which was carefully marked or numbered, along with all the other items. 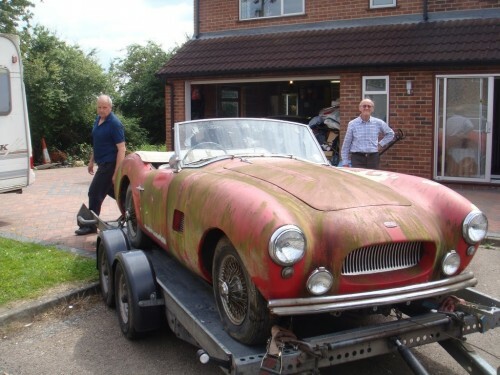 As anyone who done this sort of work knows, there are loads of different parts – one offs in the case of this Allard! Then came the time to remove the aluminium body – rear section first. We made and fitted a wooden support frame inside each section to prevent distortion after removal. The final cleaning had revealed several areas where the panels had been damaged and also small cracks at various points. Lloyd was able to repair these and add a little extra reinforcement when found necessary. As we progressed with these tasks, a series of time lapse pictures were taken with the intention of making a short 10 minute video. 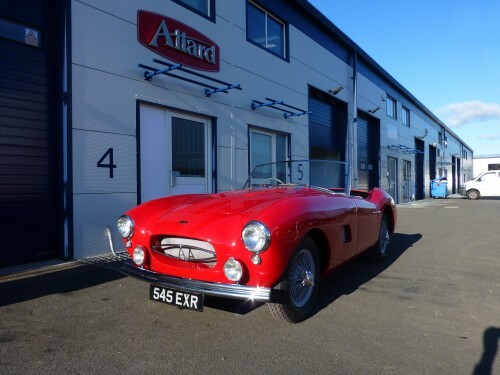 In December 2013, our new company Allard Sports Cars Limited was incorporated. Our longer term plan is to revive the Allard car marque. 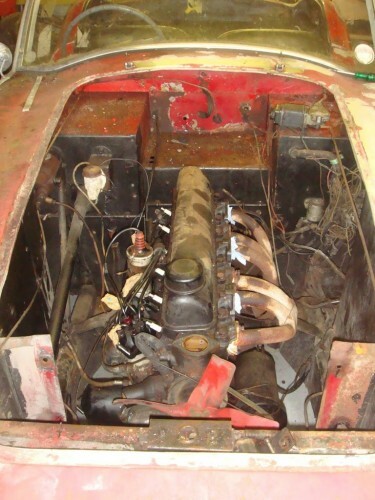 Over the 2013/14 winter, restoration progress was slow, due to other work commitments and lack of space, but the Palm Beach Mk.2 was completely dismantled, with some difficulty due to the rusted bolts and many of the fittings. These were boxed and labelled – patterns or drawings made and both still and time lapse pictures taken of the dismantling work. During this time, other Allard work was going on in parallel with the restoration. This included working with Dudley Hume to acquire all the drawings for the Allard JR we are building, which was designed by Dudley back in 1952/53. Lloyd and Simon extended the workshop floor space by building in a new mezzanine floor. Then we transferred the chassis jig to the new mezzanine floor, where it was reassembled and work commenced on the build of a new JR chassis. After completing blast cleaning work on the Palm Beach chassis, it was also taken to the workshop in Gloucester where it was checked on our jig. It was always our intention that the Palm Beach restoration would be done by Lloyd and myself, with very little outside assistance apart from the final hand finishing, preparation and painting of the body, along with some of the trimming. This of course meant, because of other work, that the restoration would take longer involving Lloyd working on it during evenings and weekends. The major new items which we had fabricated, either in steel or aluminium, apart from the floor and inner door panels which are plywood include: bulkheads front and rear; engine bay side panels with support ribs; radiator surround panels; air duct rocker panels below doors; rear of door slam panels; two fuel tanks; rear inner wing panels; front and rear ‘bumper’ assemblies and many other smaller items on a car like this, which was one of only six and the first one of the six, the list of individual parts to be made or sourced seems endless, emphasised by the fact that we wanted to keep the Palm Beach as near to the original as possible. Our intention was to restore this car, apart from the final finishing, painting of the body and some of the trim, by ourselves. Effectively a car designed by Allards – made by Allards and restored by Allards. We have restored it ‘authentically’ as far as possible to the original specification and build quality. The mark 3 Palm Beach that we are working on, a car that would have been produced in 1958/59 if the Allard Motor Company had continued to manufacture cars, will look similar, but will be significantly improved with some improved components under the skin.